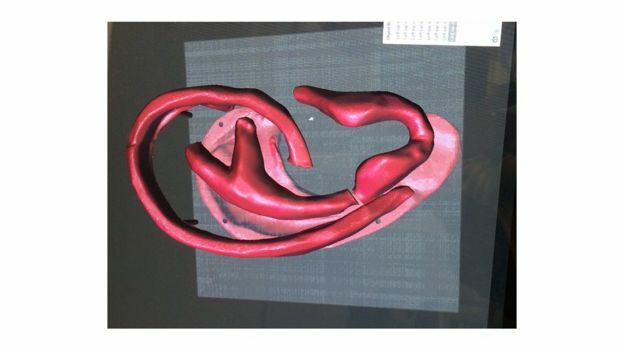 A Scottish hospital is using 3D scanning technology to create new ears for children. The Royal Hospital for Sick Children in Edinburgh is using a scanner and printer in a process which creates a perfect template. This is then used as a model by a plastic surgeon as a replacement ear is carved out of the child’s rib cartilage. In many cases, the procedure can help restore hearing. When Anya Storie was born nine years ago it quickly became obvious there was something wrong. As she puts it herself, she has an “odd ear”. Her left one is perfectly fine but her right ear has not developed. She says some people tease her about it but the overriding problem is that it affects her hearing. With only a little prompting from her mum Aurea, Anya can even tell you the correct medical term: Microtia. That’s when the pinnea – the external part of the ear – is underdeveloped. Anya is not alone: some children are born with deformed or missing ears, others damage then in accidents. Happily in many cases plastic surgery can restore both their appearance and hearing. That is why Anya is attending the Royal Hospital for Sick Children in Edinburgh where plastic surgeon Dr Ken Stewart is an expert at rebuilding or creating young ears. In Anya’s case that means three operations: one to fit the structure of a new ear, carved from her rib cartilage, beneath the skin on the side of her head. After the skin has conformed to that, a second op will move the replacement ear into position. Only after that can the third procedure begin: to open the ear canal which has been closed since Anya was born. New technology is helping create Anya’s replacement right ear. It uses a handheld scanner made in Luxembourg by a company called Artec 3D. As their name suggests, the scanner captures a 3D image. Anya sits as still as can be expected of someone who seems to be full of beans on a permanent basis. On a computer screen there slowly builds an image of her left – normal – ear. Software then flips it to create a 3D mirror image: a matching replacement for the other side of her head. The data is sent more than 15 miles to a 3D printer at St John’s Hospital in Livingston. It makes a hard copy of the image – a plastic model for a plastic surgeon. Suitably sterilised, it will go into the operating theatre as a guide to how the new ear should be carved out of Anya’s rib cartilage. 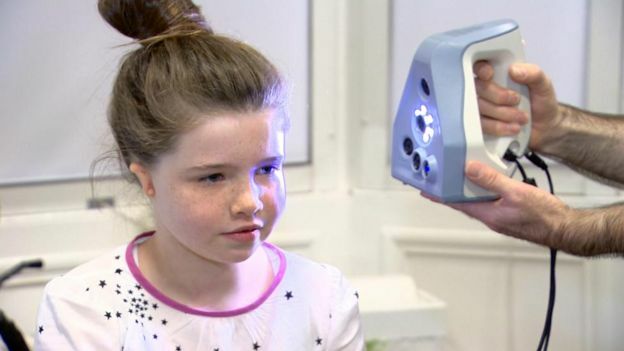 The 3D scanner has been paid for the charity The Edinburgh Sick Kids Friends Foundation. Ken Stewart says it’s transformed his team’s work. “We’re able to get more sophisticated carving, we’re more able accurately to replicate the details of the opposite ear,” he says. “We’re also doing some work with the Centre for Regenerative Medicine at Edinburgh University. Anya appears to have become an expert on the procedures she’s about to undergo. And she’s not worried about the possibility that it might hurt a wee bit. The good things? She laughs as if that’s a silly question, which on reflection it is. Anya’s mum Aurea Storie is delighted that Anya has been scanned, the model for her ear printed, and is ready for her operation. “The timing couldn’t have come along any better in terms of the new technology,” she says. “That, combined with the skills of our surgeon.